Have you seen what Angelini @suchastitch has been up to? 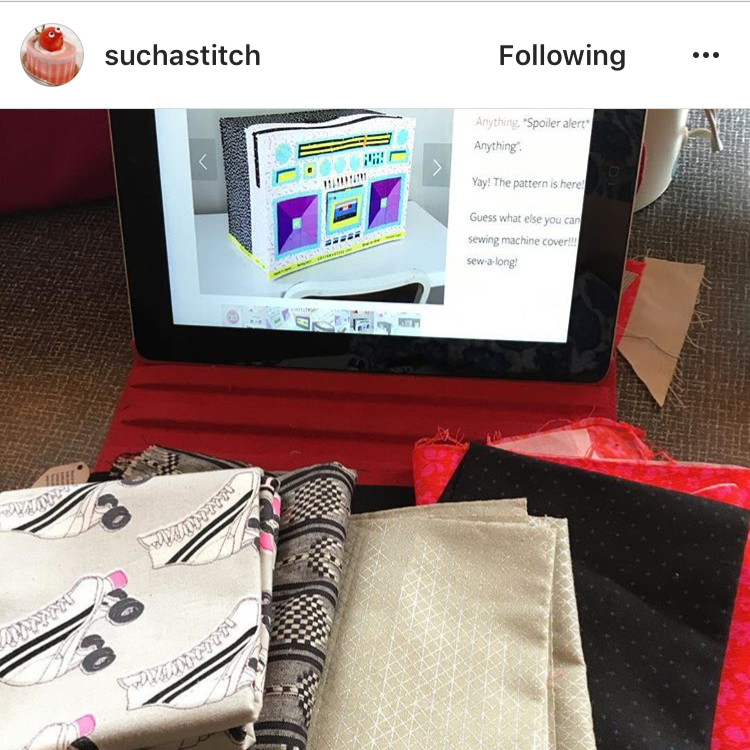 I've LOVED seeing her progress on Instagram (#boomboxsewalong #lysaflowerpatterns). She's posted photos, starting with an inspirational BOOMBOX art wall, to her colouring sheet including her fabric selection and ALL her sewing (especially those teeny tiny pieces). Have a look at what a smarty pants she was! On the tiny pieces on the back of the pattern I noticed she coloured them! BRILLIANT! She also made two cassettes. She wasn't happy with the first one (which I loved) so she made a new one (which I also LOVED). I could never choose between them. Please done ever make me! This week the sew-a-long is quite exciting! The boombox gets sewn ALL together. Next week is even more exciting because we're going to be making the cassette zippy pouch! Yay! All right. I need to settle down, I'm getting a head of myself. This weeks instructions you can get HERE. RECOMMENDED PRODUCT: I like spray starch. There I said it. BUT did you know starch is made out of potatoes? You know who likes potatoes? Bugs. The last thing I want are bugs to be interested in my quilts. Or my anything! Here's a solution. Soak! Have you heard of it? This spring I came across their booth at Quilt Market. I also like smelly things. There I said that too. I prefer scents that are fresh and not to flower-y. They have dreamy scents! Their solution to spray starch is called FLATTER. It gives me that extra crispness I'm looking for when I'm paper piecing my heart out. Oh and they also have (soy based) labels designed by Carolyn Friedlander and Deynse Schmidt. Pretty, nice smelling and useful. I'm sold. RECOMMENDED FOR YOUR 80's PLAYLIST: Styx-Too Much Time On My Hands. Check out this Jimmy Fallon Split screen - Hilarious! PS. Speaking of time, this week I came across this quote: Time is an equal opportunity employer. Each human being has exactly the same number of hours and minutes everyday. Rich people can't buy more hours. Scientist can't invent new minutes. And you can't save time to spend it on another day. Even so. time is amazingly fair and forgiving. Not matter how much time you've wasted in the past, you still have an entire tomorrow. - Denis Waitely - Serious!